The beginning of the year is the perfect time to look back on the year gone by. Looking back gives us a moment to remember what great things we achieved, what we still need to work on, what mistakes we don’t want to repeat, and what we see ourselves doing in the new year. 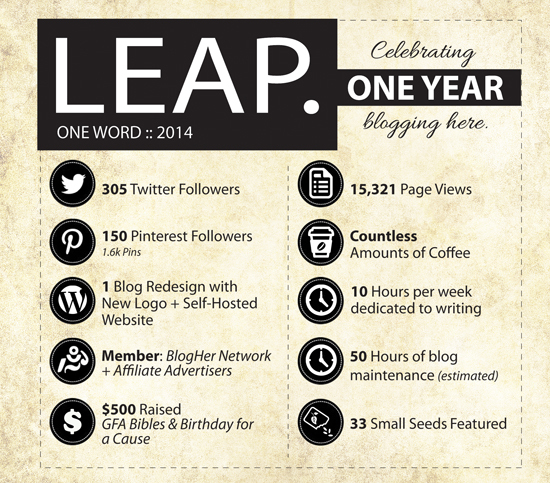 For me, 2014 was all about leaping, blogging, and finding my voice. It was a thrilling, and sometimes frustrating, year of blogging. Moving from a free WordPress blog to a self-hosted blog with a custom URL was a huge LEAP of faith. It was as much work as I thought it would be, and then some. There were days when I wondered what I had got myself into. It was a huge learning curve. Blog maintenance was a big time sucker. Oh, how I miss the days of WordPress doing all the work of staying on top of plug-in updates, broken links, and spam control. I estimated I spent 50 hours on maintenance, but that is probably a low guess. There was the time I went months with little maintenance, then BOOM…I had 200 broken links that needed to be fixed after an update was installed. Learning curve. Happily, I reached all my blogging goals for the year, including, a new blog design and logo design, learning some HTML coding, adding affiliate advertisers, and becoming a member of BlogHer Network. I know the numbers above don’t mean much in the blog world. But, compared to 2013, my organic page views almost tripled in 2014. I learned a lot about you too. Turns out three of my top five blog posts were about craft projects. The other two were faith based posts. Interesting. I took on a variety of new projects and writing assignments. 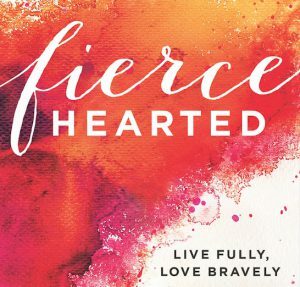 I connected with some really awesome bloggers around the world, some of whom I will be collaborating on blogging projects in the near future (The Warrior and the Flower). I also used the necessary evil called Social Media a lot more. And, I consumed an unknown amount of coffee. I’ve got myself a bit of an addiction. I also launched Small Seeds, featuring bloggers who are growing in faith and compassion. I don’t know where this will take me, but I am continuing to pray about this aspect of the blog. My whole-hearted thanks to all of you who continue to read my blog. I hope that you have found inspiration here, and continue to do so. I ultimately blog for myself, but when I see your comments and page views, I won’t lie, I feel all warm inside. Because of you too, we raised money for charities that help those in need and spread the Word of Christ. And, thanks to the inspiring faith bloggers out there (Holley Gerth, We Are That Family, Chatting at the Sky, & Faith Barista). You ladies rock! Still leaping. I am far from knowing everything there is to know about running a blog, so I will continue to learn, grow, and, of course, leap. But for now, it’s time to focus on other aspects of my creative life, which will involve choosing my One Word for 2015. Yep, I’ve got mine chosen, but I will reveal that after January 1st. Do you have yours?